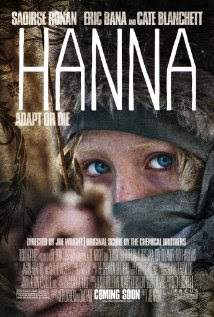 Hanna tries to be too much in it's allotted 110 minutes. It is part drama, part action. It is a movie about the growing up of innocence, and the bite of truth. It is simultaneously a movie that is clearly inspired by the stylized action genre like Kill Bill or Sin City, yet it is a movie that takes itself too seriously. A movie, no matter how great, can reconcile some of these differences. For Hanna, notwithstanding how dangerously adorable she might be, the extremes it straddles on is one too many. It is no doubt a great movie, but the feeling at the end of it is less of fulfillment and more of abrupt emptiness. Erik (Eric Bana) is a rogue agent, who is living in the cold arctic tundra, away from all civilization except for his daughter Hanna (Saoirse Ronan). Hanna, under the watchful and tough-love supervision of her dad, is developing the smarts of a soldier even thought she is just 16. The reason for their exile is the ruthless CIA handler Merissa (Cate Blanchett) who is determined at all costs to eliminate the duo. The training of Hanna ostensibly has a single purpose, to avenge the death of her mother, and break the hold Merissa has on their lives. For this, she learns to live off the land, martial arts and weapons combat, along with a smattering of European languages. While she has never known modern luxuries like electricity or music, she has trained hard to know everything that the encyclopedia has about them. This makes Hanna a strange sort of a teenager, knowledgeable and deadly but with no personal experiences. When Hanna finally decides she is ready for her mission, she finds herself halfway around the world, in Morocco, trying to outwit a gang of killers on her trail while trying to figure out the workings of a electric switch and change channels on a television. One cannot help but question the training methods of her father, who resorted to a singularly isolated approach. Hanna's tentative exploration of the modern world is reminiscent of Mowgli, but for the fact that she also has to do what Jason Bourne himself was barely able to accomplish. Thankfully, these irreconcilable differences are only apparently in hindsight. The narrative however, glosses over these differences to instead focus on Hanna herself. Ronan is great as the lead character. She has a natural sense of wonder, and quiet determination that serve her in good stead. The deep intensity she displayed in Atonement was definitely not a fluke. Bana seemed a little scattered. While it wasn't clear if this was by choice, it definitely was distracting. The star of the movie however was Blanchett. Sharing screen time with the lead character, she had the glint of ruthless evil, which alone justified all the training in the world for Hanna. With an obsessive focus on dental cleanliness, Blanchett is stereotypical as the morality bereft CIA operative, and unique as one that seemed to gain nothing personally by being that way - the mark of pure evil. There are others that augment Blanchett's evil persona, and one in particular is Isaacs (Tom Hollander) a flamboyant assassin with a penchant for white suits, whistling and torture. The movie's screenplay does well to stay clear of any plot explanations, instead constructing elaborate movie segments with little indication of the connection between them. Camera work was notable for one of the shallowest depth of field shots ever, millimeters under what was candle light. Music and the background score was the heartbeat of the movie. The techno funk track, with its catchy leitmotif is responsible for setting the tempo for all the action scenes. Jason Bourne is the gold standard for rogue CIA operative redemption. It is certain that any future rogue operative movies would only try to up the stakes. But a 16 year old who has never known anyone other than her own father, is probably taking it too far. No matter how much you don't want your mind to intrude, there is only so much your heart can take before it too begins to demand answers. Answers neither Hanna nor her screenplay writers are able to provide.